Windtraveler: Getting Your Captain's License is NOT Easy! Getting Your Captain's License is NOT Easy! The mountain of paperwork Scott had to submit! While many of you may have thought that completing his USCG captain's license course was enough to become a "captain" - that was only the beginning...it is an incredible the amount of work to get your actual license, and Scott has been filling out, organizing and cross-checking paperwork for weeks in order to make sure he doesn't miss a step. What does getting your captain's license entail, you wonder? For starters, you must be 18, pass a drug test and a very difficult maritime exam, have a recent medical physical (within last 6 months), and obtain a TWIC card from the Department of Transportation. Then, of course, there is the sea time. This is the hardest part by far. To get a United States Coast Guard 100 ton license (which Scott has completed the course for and is applying for) you must account for 360 days at sea. You'd think that sailing for a year, more or less non-stop, would have covered that with ease but there is a glitch: a "day" can be no more than 8 hours in a 24 hour period. If we spent 24 consecutive hours sailing to a destination (which we did plenty of), that is only considered one day, not three like you might assume. This meant Scott had to supplement the hours spent on our boat and go back to his racing days to log all the hours he spent on other boats (which were many) in the past ten years. (make sure to check them MULTIPLE times to make sure you have everything and that you have completed all forms properly!). Once submitted, their average turn-around time is no more than 15 days. If Scott has one piece of advice for those of you who are thinking about getting your captain's license, it is to LOG YOUR HOURS AS YOU GO. The form you need can be found here, and if you fill these out as you go, the arduous process of paperwork will be much, much easier when the time comes. Obtaining your STCW supposed to be pretty challenging and it includes a significant amount of playing with fire. Rest assured, we'll tell you about it when he comes back! * HUGE thank you to those wonderful captains who took the time to respond and help Scott out - your efforts are appreciated! Informative post Brittany! It reminds me of the process for getting my Airline Transport Pilot's license. Very arduous and it took many years. Do you know if you have to log all the time on the CG form you linked to, or can you keep it in a logbook like we do in aviation? I saw Mike from ZTC had gone with the UK's Yachtmaster license rather than the USCG license, any thoughts as to which is better for a career at sea? Wow, that is a lot of work but worth it in the end. Thanks for the info and it was very informative. Any perspective from a woman captain out there? 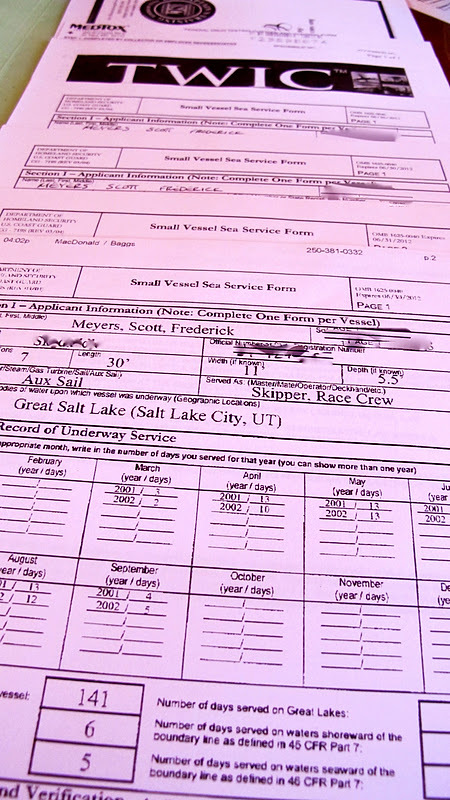 Any resources or links for woman who might embark on this process of obtaining boating license? Please share any information you might have available. Thank you!! Brittany, have you considered getting your license as well? Thank you in advance for any responses.